Omphalocele represent the commonest abdominal wall defects. Giant omphalocele is one of its subtypes, containing liver in its entirety. Due to various syndromic and non-syndromic associations and gross viscero-abdominal disproportion, post-operative outcome poses a challenge. There have been a lot of disparities among surgeons deciding the operative technique. We pluck the courage to report a yet another method of successful single layer primary closure of a giant omphalocele in our institute, well equipped with intensive care facilities. Omphalocele can be defined as ventral herniation of the contents through an abdominal wall defect into a sac, made of peritoneum, Wharton's jelly, and amnion. The sac may contain gut, or solid organs like liver, spleen, and pancreas. Giant omphalocele, in general consensus, refers to a defect of more than 5 cm, having liver as its major content . The entity represents a failure of physiological herniation to regress back into the abdominal cavity between 6 and 10 weeks of gestation. These can be diagnosed antenatally, at or beyond 18 weeks of gestation, but presentation after birth and delayed reporting in a developing country is common. Intestinal, pulmonary (54–70%), cardiac, chromosomal malformations have been associated with this condition (67–88%), although we could find none in our case. The post-operative course is bothersome mostly due to the degree of mismatch between the herniated contents and abdominal cavity. Compartment syndrome and its sequel, as respiratory distress, acute renal failure, hypotension, or intestinal ischemia are therefore anticipated. A series of publications have been found regarding the management of omphalocele. However, the treatment options have often been individualized by the authors. We, as surgeons, take this opportunity to present a successful single layer primary closure of an omphalocele in a toddler, with an equally sound post-operative and early follow-up recovery. A 2-year-1 month old female child, reported to our outpatient department, 6 months back, with a midline peri-umbilical swelling, measuring about 12 cm × 8 cm. The swelling was noticed at birth and was gradually increasing in size with the growth of the child. Bowel and bladder habits were regular. Clinically, a wide abdominal wall defect of similar size could be felt, but the swelling could not be reduced completely. The skin over the swelling appeared stretched out and scarred [Figure 1]. Ultrasound scan was then sought and it confirmed the above as umbilical hernia containing part of liver and gall bladder. Otherwise, abdominal scan and echo parameters were normal. A diagnosis of omphalocele major was made and primary repair planned. The defect was approached through midline incision because midline skin was looking wrinkled, thickened, and scarred. On exploration, liver was hanging free from ligamental attachments, apart from its vascular pedicle and had taken globoid shape, fitting the swelling margins. It was densely adhered with the adjacent peritoneum. 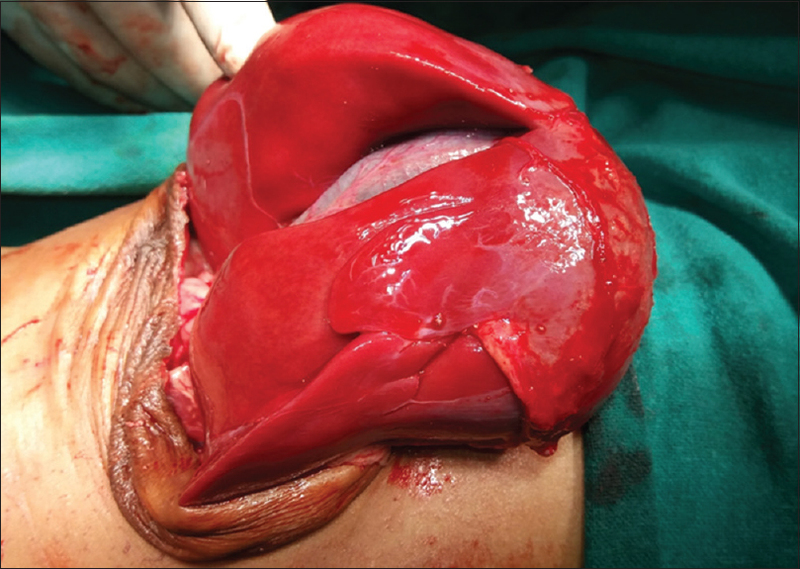 Meticulous adhesiolysis was performed to separate liver from peritoneum [Figure 2]. To increase intra abdominal space to accommodate liver, manual stretching of the abdominal wall, and relaxing incision over lateral abdominal wall given intra peritoneally. Defect repaired in a single layer by interrupted horizontal mattress suturing with vicryl. Scarred and redundant skin was excised and closed with interrupted sutures. To avoid over simplification, we kept the child nil per oral and on total parenteral nutrition for 5 days, in an intensive care unit having supportive ventilation facilities. To prevent rise in intra abdominal compartment pressure by decompressing stomach and urinary bladder, we kept the child on continuous naso-gastric tube aspiration and per urethral bladder catheterization. However, the baby managed a sound convalescence in the early post-operative period and on 3-month follow-up. We, therefore, favor the midline single layer primary closure with manual stretching and relaxing incision over lateral abdominal wall approach to a case of giant omphalocele. This will help to excise scarred tissue and tension free abdominal wall closure. Omphalocele has been classified according to the size of the defect and giant omphalocele is one of them, having liver as its main content. Maternal serum alpha-fetoprotein levels, karyotyping, and ultrasound scan can assist the antenatal diagnosis of the condition, but late presentation is common in developing countries. Over decades, considerable literature could be found devising various techniques for omphalocele repair, ranging from staged reduction using the silo, tissue expanders, to definitive closure using component separation technique, or mesh or graft assisted., Major considerations guiding the treatment options and outcome are the size of the defect, estimated disparity between the abdominal cavity and the herniated viscera,, morbidity due to associated anomalies, expected length of hospital stay, availability of intensive care facilities, risk of infection of various prostheses and last but not the least, the expenses incurred. We promote the use of single layer primary closure in a case of uncomplicated giant omphalocele, after evidencing a favorable post-operative recovery. This is blessed with minimum chances of infection and a short hospital stay. To conclude, single layer primary closure has a successful outcome in a case of giant omphalocele. With good intensive care facilities in hand, we also patronage the use of the same by our peer group. We performed this approach in a single case but a randomized controlled trial is needed to establish this approach. We are thankful to members of the department of Pediatric Surgery and Anesthesia for their kind support. Thieme G. Developmental malformations of the fetal ventral body wall. Ultrasound Q 1992;10:e65. Mack AJ, Rogdo B. Giant Omphalocele: Current perspectives. Dovepress open access to scientific and medical research 2016;6:33-9. Davis NM, Kurpios NA, Sun X, Gros J, Martin JF, Tabin CJ. The chirality of gut rotation derives from left-right asymmetric changes in the architecture of the dorsal mesentery. Dev Cell 2008;15:134-45. Khalil A, Arnaoutoglou C, Pacilli M, Szabo A, David AL, Pandya P. Outcome of fetal exomphalos diagnosed at 11–14 weeks of gestation. Ultrasound Obstet Gynecol 2012;39:401-6. Gamba P, Midrio P. Abdominal wall defects: Prenatal diagnosis, newborn management, and long-term outcomes. Semin Pediatr Surg 2014;23:283-90. Danzer E, Gerdes M, D'Agostino JA, Bernbaum J, Siegle J, Hoffman C, et al. Prospective, interdisciplinary follow-up of children with prenatally diagnosed giant omphalocele: Short-term neurodevelopmental outcome. J Pediatr Surg 2010;45:718. Bedi NK, Grewal AG. A simple technique for the repair of a complex case of exomphalos major. Int Surg J 2014;1:102-7. Lee SL, Beyer TD, Kim SS, Waldhausen JH, Healey PJ, Sawin RS, et al. Initial non-operative management and delayed closure for treatment of giant omphaloceles. J Paediatr Surg. 2006; 41(11):1846-9. Foglia R, Kane A, Becker D, Asz-Sigall J, Mychaliska G. Management of giant omphalocele with rapid creation of abdominal domain. J Paediatr Surg. 2006; 41(4):704-9. Morabito A, Owen A, Bianchi A. Traction-compression- closure for exomphalos major. J Paediatr Surg. 2006; 41(11):1850-3.